This morning I received the following email from Cat Bordhi. It was sent to the participants of her two island retreats. Cat has asked that it be passed on to knitters all over the US, and I think it’s a lovely idea. I currently have a moebius on my needles, and I will knit along with Cat tomorrow with healing intentions. I awoke this morning realizing that publicly knitting a beautiful Moebius scarf as I begin to float (I live on an island), drive, and fly toward Stitches East on Tuesday would be a beautiful and profound public expression of my hopes and dreams for the world, as well as a symbol of the healing that our country will need after the election. 1. The Moebius appears to have two surfaces and two edges – ie, polarities such as black and white, right and wrong, good and bad, Republican and Democrat – but when you follow the surface around you will run right into your starting point without ever having changed to the other “side.” For there isn’t one. Everything flows into itself. Polarities are an illusion. What lies beneath the apparent polarities is oneness, beauty, and grace. In a Moebius you can see it, hold it, be awed by it. Once the frenzy dies down, hopefully those with opposing views will slowly rediscover their common humanity. 2. Like the surface that flows into itself, so too does the Moebius’s single continuous edge – thus everything is recycled. In fact, I would not be the least bit surprised if the ultimate alternative energy involves a Moebius form or dynamic. By the way, the recycling symbols (2 are in common usage, one with a single twist, the other with 3) you see everywhere are actually Moebii (too hard to say Moebiuses – try it!). I think we are all hoping for significant and effective new discoveries in alternative energy – and the Moebius would be a great symbol for this global effort. 3. Once you complete the first ring (it takes 2 rings to make a round – watch the video) of your Moebius, you are in for smooth and happy sailing. All you have to do is to knit the stitch in front of you, then the next stitch in front of you, with not a care in the world for what came before or what has shifted into the “future”. You’ll look at the mysterious shape on your needles and wonder how “those stitches” can ever come to you . . . well, they will, without your needing to understand how. And they will all come in perfect sequence, resulting in a beautiful and graceful Moebius. The Moebius rewards your faith in its mystery with the easiest knitting you will ever do. And the result is always graceful – for this is the very nature of the Moebius. You can knit along while you watch the election results, while walking, while standing in line at the store, wherever you may find yourself during these days to come. You will be knitting the graceful healing and ease that I believe is flowing toward us, requiring only of us that we stay true to the powerful sense of loving kindness that resides in the center of every person. No one could ever possibly understand enough to make the healing happen, but if we all just knit the stitch before us, as they come, marveling at the innocence and sweetness of it all, with our oh so familiar continuous strand of yarn, the healing will happen. We need not understand either one fully – the Moebius or the world. They both operate with inherent grace. 4. I looked through my stash and chose a luminous yarn in deep watery colors from Blue Moon Fiber Arts – LSS (Luscious Single Silk), and did not realize until I looked at the label that the colorway is absolutely apropos: Lunasea. Tina no doubt named the colorway after the moon and the sea – and after lunacy? So let the lunacy of the election months give way to Lunasea – the grace of the moon, the sea, the Moebius, and the beautiful heart of humanity, of all people, the “us” and “them” who merge into one. I shall be winding the skein on the ferry tomorrow, then knitting all the way to Baltimore. I hope to see many, many of you there. 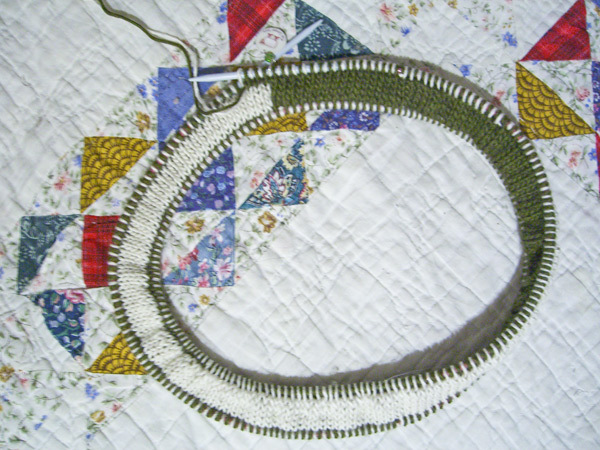 Note: If you alternate sets of knit and purl rounds, you will have purl ridges all around. Then your Moebius will not curl along the edges when you are done. It’s that time of the year again. Time to look back. Time to gaze forward in anticipation. Let’s look ahead, first, and welcome 2008. I did not remain sock monogamous to Lenore. 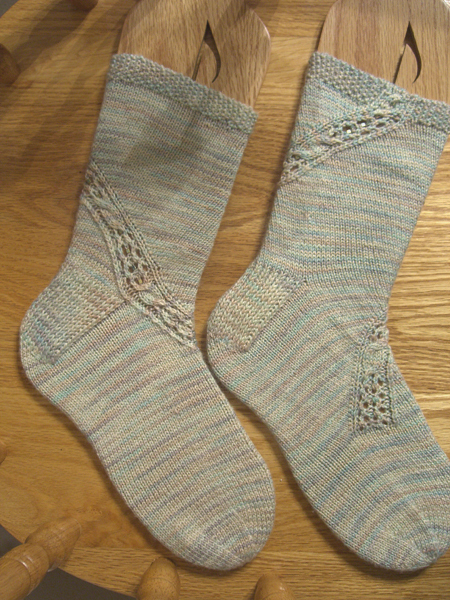 I cast on the toes of the Salish Sea Socks, the December Rockin’ Sock Club pattern. The colorway is called Bella Coola / Nuxalk. It’s a Cat Bordhi pattern. The colors are my blog colors, and Cat gave me a nice little shout-out in the pattern notes. So what was I to do but cast them on? But, I hear you ask gentle reader, what is that other unfinished strip of stripy cabled goodness sharing the picture with the Salish toes? 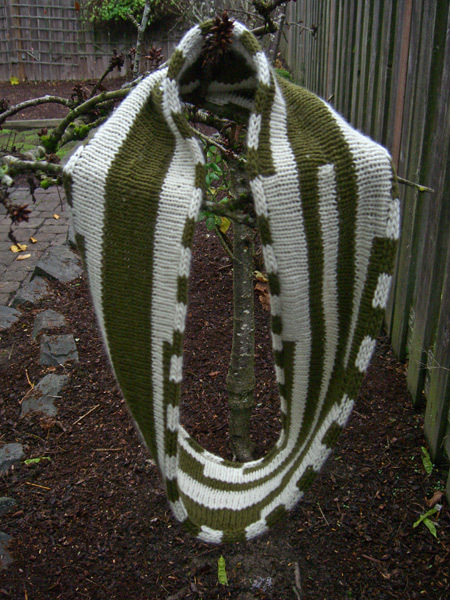 That was something I was hoping would be the last finished object of 2007. Didn’t make it. 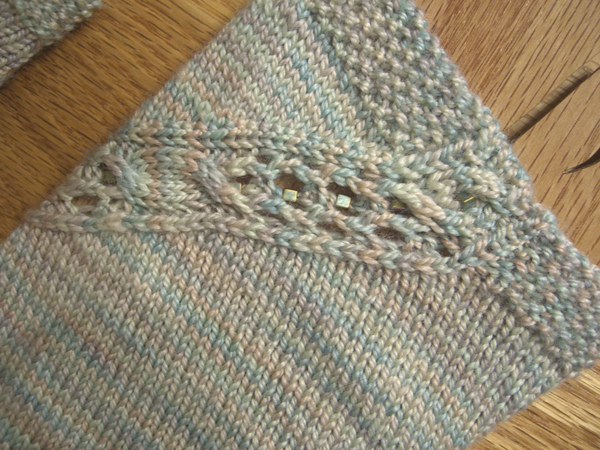 It will be the first finished object of 2008, though. I will tell you more later. For now, I will only say that the pattern comes from this book, and as soon as I saw it I knew that I had to knit it. When Tangle had the right yarn, the deal was sealed. Also looking ahead: #1 Son left yesterday for a 5-week trip to Brazil. Yeah. South America. I was not allowed to go to the airport, because Moms are so lame at airports and stuff, you know. But he called me from the airport to let me know he was there. And he called me again to let me know they were ready to board. And he called me again to let me know that their flight to Chicago had been delayed. And he called again to let me know that they had landed, finally, in Chicago but missed the connection to Sao Paulo, and now had to stand in a really long line. And then he sent a text message to say that they had tickets on a flight leaving today. And then he sent a text message to say Happy New Year and that he was at a party with Chicago friends. I have not heard yet today. He has promised to call occasionally and maybe send an email now and again. Five weeks is a long time. Brazil is very far away. In other non-knitting news, my old lady cat, Phoebe, has been diagnosed as hyperthyroid, thus explaining her weight loss and erratically needy behavior that was so odd in a crotchety cat that mostly just wants to be left alone — except at night, when a great deal of lovin’ is appreciated at bedtime. The good news is that it’s a condition that is, actually, curable in a fairly easy way. The bad news is that the condition may be masking chronic renal failure, which is not curable. So Phoebe is on medication to bring her thyroid levels down to normal so her kidneys can be evaluated. In all of her 15 years, Phoebe has never been sick or required medication of any kind. Since she tends to hold a grudge, I was not looking forward to shoving a pill down her throat offering her medication twice a day. But my vet carries this wonderful invention called Pill Pockets. Slip the pill inside the formed treat and smoosh the end closed, and the designated pet chomps it down. Phoebe loves them. So the only issue is keeping Kidd distracted while Phoebe eats her treat. Moo doesn’t count here, because she doesn’t like treats of any kind. She only eats cat food and yarn. In January, I decided to buy yarn. And I kept that promise all through the year. So much so that I think in 2008 I will be a bit more restrained. Blue Moon suffered through their well-publicized bank problems. And my sock class was canceled because of snow. February saw the Snake River Socks released into the wild, unfortunately, it turned out, with several errors. #1 Son borrowed my vacuum. My brain turned up missing in action as I tried to figure out the right number of stitches to go around a sock leg. The first Rockin’ Sock Club shipment came in March. I resolved to knit socks only with my classes (resolution soon broken). My socks were lost and then found and, it turned out (via contest), may have been running a little underground resistance movement against sock abuse. April opened with the Magical Moebius Festival in Newport. Knitting and food and yarn and food and Cat Bordhi and food and whales, and I knit a giant moebius (unintentionally) that 11 people fit into. And it was too far to drive 10 miles to my house, but not too far to drive to Eugene or Seattle. In May I had the plane trip from hell. While I was in Miami, #1 Son called from Toronto to ask if I could move his car in Portland (it was towed). We lost Grandpa Barney. And I learned that I still remember how to execute a perfect slightly imperfect pratfall. June found me proving my extreme dorkiness whilst meeting The Yarn Harlot. PDX Knit Bloggers were born (can’t believe it’s only been since June). The Clapotis That Never Ends… finally ended. In July I visited Boston yarn shops (and my cousins). The PDX Knit Bloggers had their first meet-up at Knit Purl. #1 Son reached v1.9. I was both sorted into Ravenclaw and Simpsonized. August started with a heelish experience. Sockapalooza 4 finished and I was spoiled nicely. Maia arrived for a PDX Yarn Crawl — on my birthday! I still owe the Bo Diddley sock pattern to several people. A gorgeous new Cat Bordhi book, New Pathways for Sock Knitters: Book One, was published. My name is on page 22. And I was kept suitably humble by my first autograph requestor who said, I have no idea who you are but apparently you’re famous, so please sign my book. I had more fun with Judy’s Magic Cast-On in September. I also learned that it’s a good thing to pay attention when one is turning cables. At OFFF I met a Rasta sheep and fell off my yarn diet. Hard. October started with a very interesting computer rebuild. (lovin’ the new computer now, though) I attended the first ever Floating Knitting Retreat with Cat Bordhi and Lucy Neatby and had a wonderful time. I obtained my first ever MP3 player (knitting videos on my iPod!). We planted a tree for Barney and the Ravens landed. In November, Tina destashed and knitters everywhere helped out. The rose arch finally gave up the ghost. I made a swift from Tinker Toys. I was thankful for finally finishing The Great Green Glob. Not so thankful when it turned out there was a dropped stitch requiring major post-blocking surgery. I was sick for a lot of December. But I knit a scarf for #1 Son and started The Wings Of A Dream in Blue Moon Silk Thread. 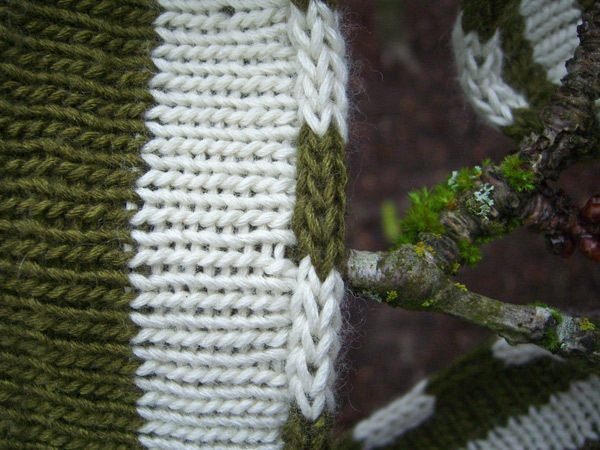 I pondered the future of knitting. I made carrot soup instead of carrot pudding. And I was given the gift of snow on Christmas. Chances of finishing this list by 12/31/2008? We shall see. The gallery with the pictures should be working now. I’m guessing that those of you who couldn’t open it are using IE? For some reason Firefox wasn’t affected by my spelling error. Oops. Anyway, here’s the tale of what I did last week, jaunting around the San Juan Islands with a bunch of crazy knitters. I picked up my roommate, Tricia, along the way to Friday Harbor. Miracle of miracles — I was only about 10 minutes later than we had arranged, although I couldn’t seem to actually get on the road when I had planned. Traffic was light on Sunday. We planned to catch the 2:40 ferry from Anacortes to Friday Harbor, and we made it in plenty of time. At the ferry terminal, we ate sandwiches and chatted with a few other knitters while we waited. On board the ferry, we met other knitters. Hmmmm… there seemed to be quite a few of us all heading in the same general direction! At the hotel, we were met by Cat and Lucy. Cat had little goody bags for us with Treking XXL, Frog Tree Alpaca sportweight (mine is blue), two colors of Claudia Handpainted, a sample of Crystal Palace Maizy, notecards, and a cool little folding ruler that folds in 1-inch increments; and an envelope with our itinerary; and a sign-up sheet for the ferry shuttles in the morning. I signed up for the early shuttle every morning because that would be easy to remember. But Cat insisted that as soon as I got to my room I should also write it on my itinerary to make sure that I didn’t forget, because time, tide and the inter-island ferry waits for no knitter. She was really insistent. So insistent, that I actually did write it on the itinerary when I got to our room — which was a pleasant suite with two bedrooms, two baths, a small living room with a faux wood stove (gas) and a kitchen. Tricia and I ate at the hotel. The restaurant was pricey, but the food was very good. We both had salmon with a hazelnut pesto and mixed veggies that were excellent. The waiter was nice eye candy, but inattentive. The hotel also offered free breakfast. By the time we left I had finally sort of figured out the waffle maker. Sort of. We shared the breakfast room with a bevy of construction workers who were working on one or the other of various projects that are springing up all over the area. And knitters, of course. There were knitters everywhere. The first day started a little later, to give us all time to recover from our journey the day before. The inter-island ferry is an absolutely charming mode of transport. It’s a smallish ferry, and obviously well loved. Many of the tables hold half-worked jigsaw puzzles brought on board by commuters who work them during their regular journey. 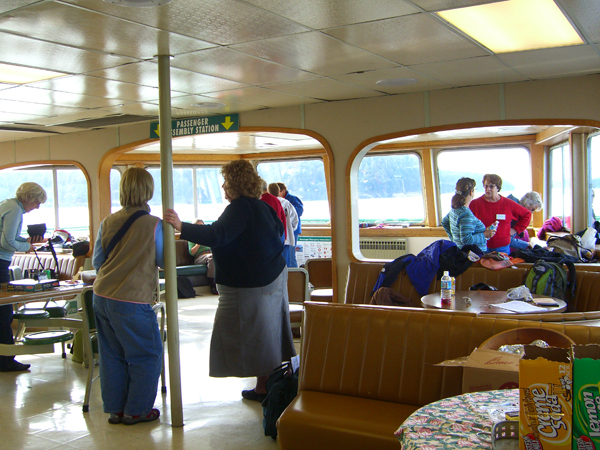 We took over one end of the ferry, which included a large area with seats on the sides that was perfect for a class, with tables available for overflow. You can see one of the puzzles in the first picture on the table to the far left. The table on the right was usually laden with goodies, lest we become faint from hunger and no longer able to wield needles and yarn. The first day, lunch was catered and included one of the best chicken salads I’ve ever had. And Cat brought home-made cookies that were just awesome and I think helped more than one knitter make it through the throes of unfamiliar knitting techniques. Lucy taught on day 1. Lucy is nutty and fun and I learned a ton from her about double knitting and other techniques. As I said before, I’m planning on a pair of socks with little pockets. I love the pocket for a Nano idea. Of course I still need to get a Nano. But I see one in my future. Pocket for a camera card is another good idea, though. In all of the vacations I’ve taken my camera on, I don’t think I’ve ever either recharged it or had to swap batteries, although I always carry one. And I can snap a lot of pictures before I need to swap cards. I don’t think I’ve every had to do that, either. I really do like my camera. We floated around and double-knit until the ferry made its rounds a couple of times and arrived back at Friday Harbor in time for dinner. We ate in town at a fish-n-chips place that I would not recommend. It was the only food in the whole trip that I could truly say was fairly horrible. After dinner, we all shopped at Island Wools, a charming little shop with tons of yarn – several of which I haven’t seen down here much. I showed admirable restraint by limiting myself to just a couple of skeins of Maizy (sock yarn from corn — whodda thunk it?) in Miami Nice (great name). Tricia and I went back on the afternoon of the third day, and I realized that there were a few other little things I needed, like one of the Lantern Moon black sheep measuring tapes. Day two was the long day. We caught the early ferry for a day of sock knitting with Cat. 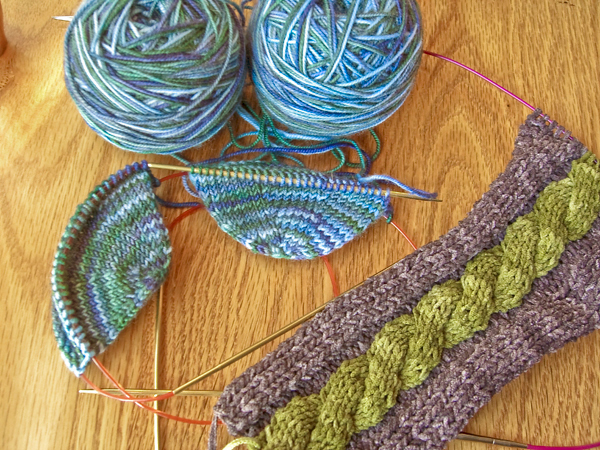 I started a pair of baby booties, and worked a little bit on the Coriolis socks. You can see the booties in the last picture. Cat is a fun teacher. She tells stories that really help one remember the techniques. I think I finally get why dividing the rpi into the number of stitches around the instep gives the length of the foot after the instep. I think. Just don’t ask me to explain it. 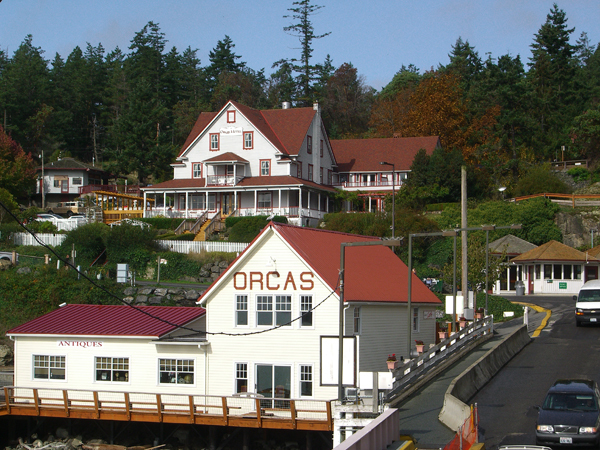 At Orcas Island we gathered up our belongings and disembarked for a wonderful lunch at the Orcas Hotel. We took over one whole dining room, and the Hotel served a wonderful sandwich and soup buffet. I realize that this is starting to degenerated into a foodie description. But, really, this was what it was like: knit and eat and knit some more and have a little snack and knit and time for a meal and knit. Really. I continued to work on the baby booties as we floated around Puget Sound on our little ferry. The ferry only made four stops: Friday Harbor, Orcas Island, Shaw Island and Lopez Island. We saw each multiple times, but never walked off at Shaw or Lopez. They look like nice islands, though. Perhaps another time I can visit them as well. After some discussion about where to head for dinner, Tricia, myself and several others just ended up at the hotel. I had soup (very good) and salad (mostly cheese). We turned in early. Knitting is hard work. The final day was a short knitting day. Cat explored moebius knitting with those who were interested. The rest of us kept knitting socks. Lunch was catered on board — chicken salad wraps. It was yummy. And there were Cat’s cookies to snack on, lest we become faint, etc. We arrived back at Friday Harbor early in the afternoon. Tricia and I did a little shopping at Island Wools, where we were given directions to the best beach on the island. Then we walked down the block to a gourmet kitchen shop — sorry but I don’t remember the name of it — where I did a bit of damage to my wallet. Oh, there was a lot of wonderful things there! I found a fig-hazelnut butter. And chalk licorice – a treat we had enjoyed on board – think Good & Plenty for adults. And they had some blooming tea, so I was able to procure some after having seen it on Bobbie’s blog and thinking I just had to have some. It’s so pretty. One of the knitters told a wonderful story about the beauty of blooming tea and some hard-bitten ranch hands that I will not attempt to repeat because I’m sure I would not be able to do it justice. I am enjoying mine a great deal. I’m so glad that I had a clear tea pot for it to bloom in. 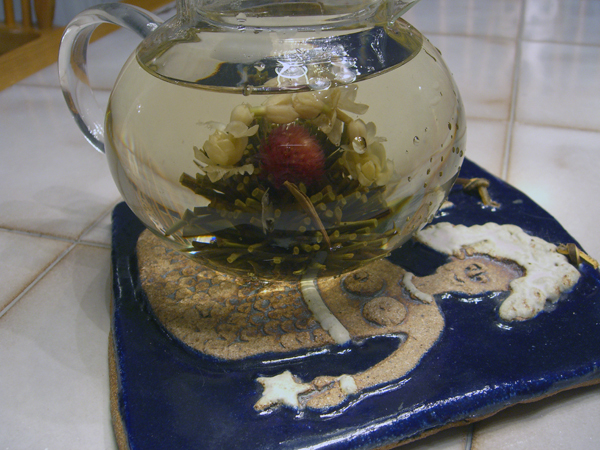 I’m not sure what the mermaid on my trivet thinks of having a very hot teapot balance on some tender portions of her anatomy. She looks a little surprised. But hopefully she is enjoying the beauty. After buying out the gourmet shop, we drove all the way around San Juan island. Our first stop was at American Camp. As well as relating some of the history of the area and the best place to see, the ranger told us the scenic route to Roche Harbor — dirt roads, but good dirt roads. And it was a beautiful drive from there up to Lime Kiln Point. We visited the lighthouse there and stretched our legs. From Lime Kiln Point, we drove up to Roche Harbor. We passed the alpaca farm, but since it was after 5:00 we didn’t stop, figuring that they were probably closed. I think we figured wrong, unfortunately, But we did enjoy looking at what’s left of the lime factory in Roche Harbor and at the old buildings. And the new condos and retail buildings that are springing up everywhere. 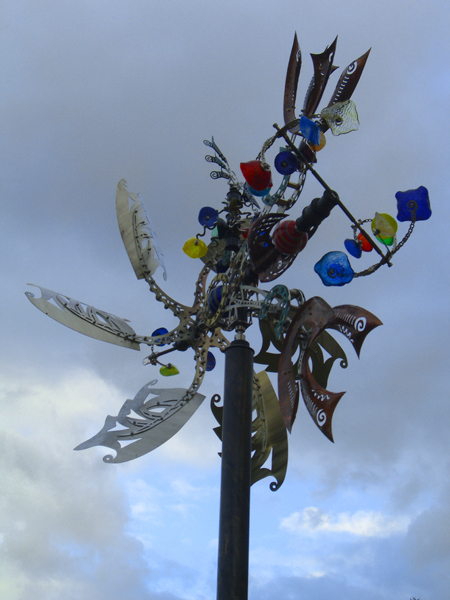 On the way back we stopped at the Wescott Bay Sculpture Park. It’s several acres of sculptures — over 100, I think. They are just scattered around in the field, in amongst waist-high grass and weeds. There are paths mowed through the field, though, so it’s possible to walk around and look at the art. I was particularly struck by the object in the picture above. I believe it’s called Feathered Phoenix, but I could be mistaken. All of those gears and arms and such move in the wind so that it’s constantly in motion and revolving and changing. I took a little movie of it also, because the thing was just fascinating. There were many other lovely sculptures, too. We didn’t get around the whole field because it started to rain, so we packed it in. On the way back to town, we saw Mona the camel. Dinner was at a very nice restaurant right next to the ferry terminal, where we all met as a group. We were joined by Cat’s daughter, Jenny, and grandson, Charlie. Cat was very much the proud mother and doting grandma — as she should be because Jenny is a lovely young woman and Charlie is a cute as a button. The next morning Tricia and I were up extra early and got in line for the ferry back to Anacortes just in time to make it on. 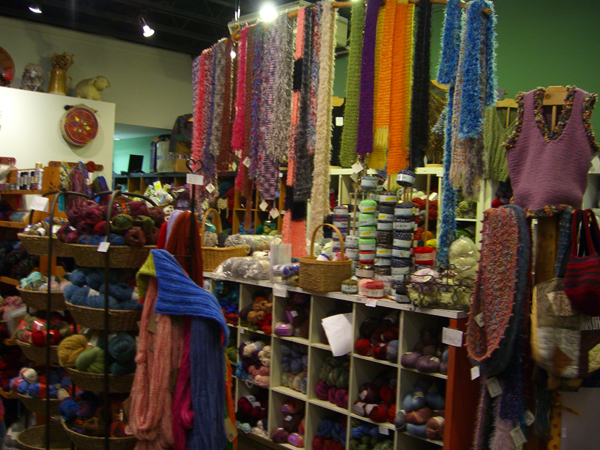 We stopped at Wild Fibers in Mt. Vernon on the way home, and I scored some very nice sock yarn that I will tell you about at another time. And now you are up to date. 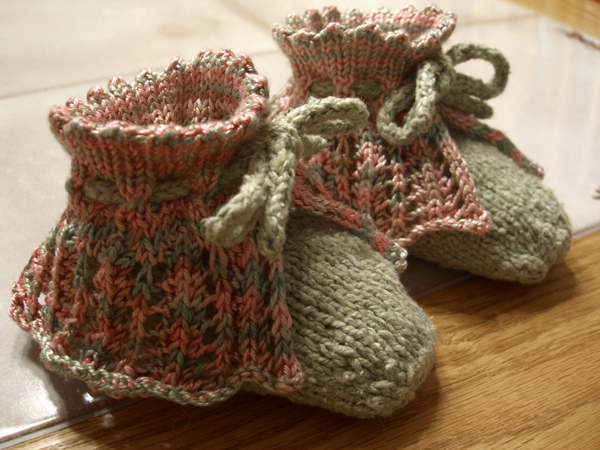 Since arriving home, as well as fighting technology I have finished the baby booties I started on the ferry. I’m fairly pleased with the results. Hopefully the intended recipient will be as well. Inner slippers: Sea Silk (70% silk, 30% Sea Cell / 100g, 400m per skein) in colorway Rose Garden a tiny bit of a skein left over from another project. Modification to pattern: None. I actually followed the pattern as written. My gauge is a little different than Cat’s, though, and my slippers turned out bigger.